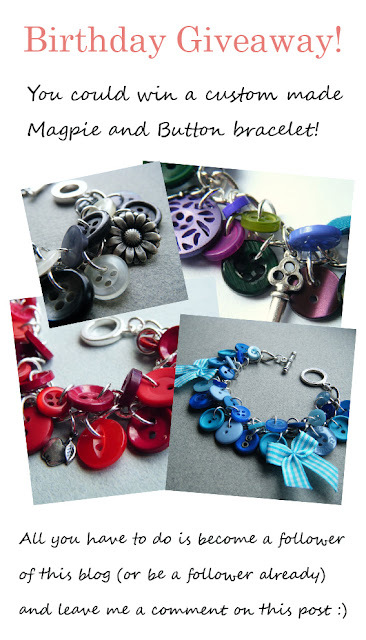 Magpie and Button: Free Magpie and Button Bracelet! As a special gift to you all, you can now receive 20% OFF ANY PURCHASE for the whole month of March, by using the coupon code BIRTHDAY20 when you check out, on magpieandbutton.etsy.com Yay!!! But that's not all! I'm also giving away the very special prize of a gorgeous custom-made button bracelet to one of you! All you have to do to be in with a chance is become a follower of this blog and comment on this post. Of course existing followers can enter too, just leave a comment below. What an easy way to get a free bracelet, made especially for you, using your favourite colours :) The bracelets pictured above can give you some ideas, or you can come up with your own colourscheme to create a one of a kind piece. Within a week I'll enter everyone who has commented into a draw and pull out the lucky winner of this lovely bracelet, worth over $25! Oh, and there will also be a mystery prize included with the bracelet - an EXTRA BONUS for you! So, do you want a birthday present from Magpie and Button? 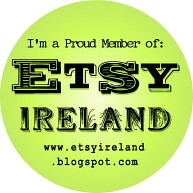 hey lovely lady - happy 2 etsy-versary! I'm a follower and I would love to enter, I have 2 of your bracelets already, and I'd love another one as I wear mine all the time! Happy birthday, I would *love* one of your gorgeous bracelets! I'd love one too! Whoever wins will be a lucky so-and-so! Love your bracelets and would really love to win one! Happy Birthday!!!! Count me in, I love your stuff! Would to win a new bracelet! happy birthday to you, happy birthday to you! id love to win a bracelet so fab and unusual. Happy birthday to you, Happy Birthday to you, I'm already a follower and I'd LOVE to win a bracelet too! Happy birthday keep up good work!